my friends convinced me into watching Milk, on a rainy day. Their powers of persuasion worked and I’m thankful it did. 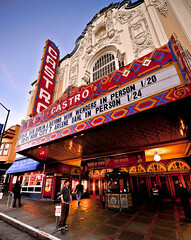 It was the last day the movie was playing in the Castro theater. 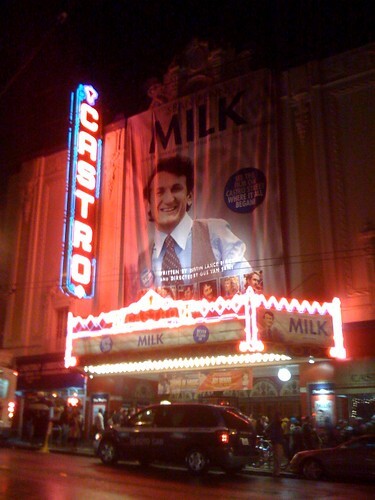 The movie was about Harvey Milk, who was the first openly gay official elected in California. Sean Penn played Harvey and I hope he gets an Oscar for it. It made me cry in the theater and saddens me that even still the rights for everyone are not the same. He did a lot to progress gay rights but there is still so much left to do. He was just an “everyday guy.” He just believed that he could make a difference in his community for the better. I have friends that feel like second class citizens because they are not given the same rights as everyone (re: prop 8). I was raised christian. I believe in God but I also believe that everyone deserves to love and be loved. Why can’t it be as simple as that? I do not want to ruin the movie for those of you who don’t know the story but I am glad he existed. He inspired me because he started his cause at age 40 and achieved something to be proud of. It is never too late to start something positive in the world, to make the world a better place. The movie will change how you feel about where we are in our country, we all want change because we all hope for something better. Remember that and keep it close to your heart. The person next to you wants good things in the world to happen. Yes I hear the cynics scoffing but generally people want the world to be better. I leave you with this hopefully familiar poem by Pastor Martin Niemöller. I found myself crying in the unlikeliest places—like during one of the early marches. It makes me wonder what has to happen for our community to get energized in that way again. The flurry of protests in November were exciting; but there’s no “movement” similar to what Harvey and Cleve were able to rally at a moment’s notice. I love the US for the freedom and opportunities its given us but there is so much left to give still. It’s sad to know there are so many puritanical & ignorant hate mongers in America. It’s no wonder we are falling into a depression. Our only hope are the progressives, thankfully more & more younger people are using their brains instead of listening to miserable & hate filled people. I was bummed that I got a shot of the theatre just days after ‘Milk’ was featured. I really want to see this movie. One of my best friends is gay and he isn’t any different from any other person (besides the fact that he likes guys and is a little girly). I guess being gay isn’t…suppossed to happen? because they can’t have children naturally, but it doesn’t mean they shouldn’t be allowed to love who they love. You can’t help who you love. I also don’t think homosexuality is a sin, because usually sins are done out of hate. And being gay is obviously not being hateful.